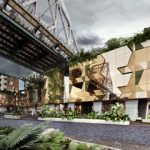 Art Series Hotels officially announced today it will open its eighth property at Howard Smith Wharves, Brisbane in March 2019. This will be the first new property for the Art Series brand since joining the AccorHotels family. Destined to be the most luxurious Art Series property yet, the $60million hotel will be carved into the cliff under Story Bridge and will feature 166 guest rooms, with custom contemporary furnishings and original artworks and giclee prints. Inspired by and dedicated to Australia’s most contemporary artists, the six-storey hotel will also offer four distinct food and beverage outlets as well as an impressive rooftop pool boasting spectacular views of the Brisbane River and CBD, bar, gym and three conference rooms, fully equipped with state-of-the-art audio-visual technology. AccorHotels Pacific Chief Operating Officer Simon McGrath said the new Brisbane property – the first Art Series Hotel to open since they acquired Mantra Hotels in May this year – would set a clear direction for Australia’s only art inspired hotel group. Located in the hottest art and cultural hubs, the second Art Series Hotel for the river city (The Johnson opened in September 2016) will enjoy all the amenities on offer at Brisbane’s newest entertainment and lifestyle destination. Breathing new life into the historic riverside precinct, Howard Smith Wharves will soon be home to an expansive brewery, abundant green spaces and picnic areas, two unique indoor event spaces, overwater bar and a stellar line-up of waterfront restaurants from some of Australia’s leading restaurateurs. Designed by the highly acclaimed multi-disciplinary practice SJB, the natural tones and textures of the hotel’s exterior will ensure it blends into the cliff face, its geometry referencing the fragmented cliff shapes and the highly engineered bridge. The lobby features a double-height wall of glass with a rugged outlook while the guest rooms enjoy spectacular city views across the Brisbane River or of cascading greenery and the sculptured rock face. Arts Series Hotels transformed the Australian market when it launched in 2009. Privately owned by the Deague family until it was acquired by Mantra last year, original artworks and prints adorn the walls and halls of each hotel. 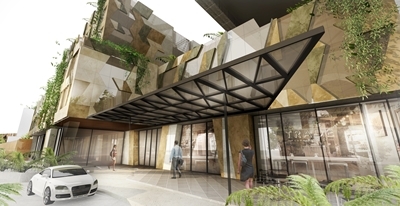 In a beautiful case of serendipity, the new Brisbane hotel is being developed by the Deague Group under the conversant eye of CEO Will Deague. The Art Series portfolio includes Melbourne hotels The Olsen, South Yarra; The Blackman, St Kilda Rd; The Cullen, Prahan; The Larwill, Parkville, The Chen, Box Hill; The Watson in Walkerville, South Australia and The Johnson in Spring Hill, Queensland. Art Series will release further details, including the hotel’s namesake artist, later this month.